Yes, if you stop by here occasionally then there is every likelihood that you have seen this a very similar quilt before. 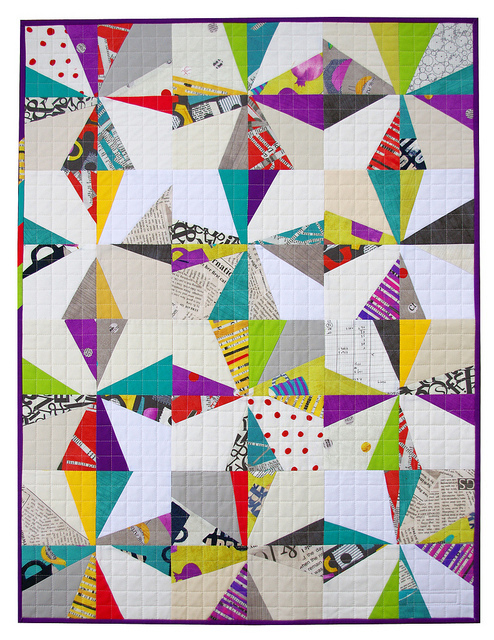 This one is a re-make and custom order for a Liberated Star Quilt using Carrie Bloomston's Collage collection which I have previously made and posted here: Liberated Star Quilt and Collage by Carrie Bloomston. Repeating a the same quilt is always harder and feels less like being creative. 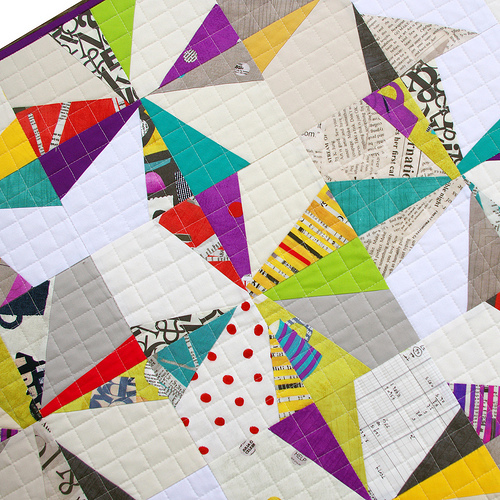 I therefore decided not to look back at images of the original quilt but rather work with the liberated and improvised process, allowing the eye to choose color and fabric placement. 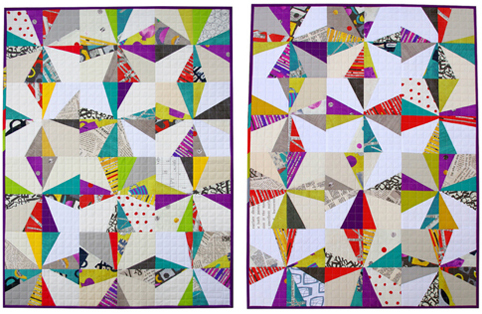 My new quilt (on the left) turned out remarkably similar, perhaps a little brighter and blue/greener. I have again quilted the quilt with an overall 1 inch grid; all lines are stitched from edge to edge. I prefer to stitch all of the horizontal lines first (because they are shorter and it feels like I have more control over the quilt and quilting this way) and then stitch all of the vertical - longer - lines. I have used the seam lines as a guide for my stitching lines as well as a quilting guide attached to the walking foot when the distance from the seam line could no longer be "eyeballed" with the required accuracy. 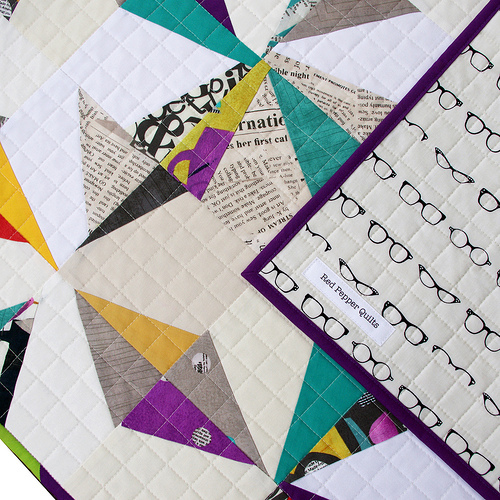 For the back of this quilt I have used Geekly Chic - Glasses by Riley Blake. 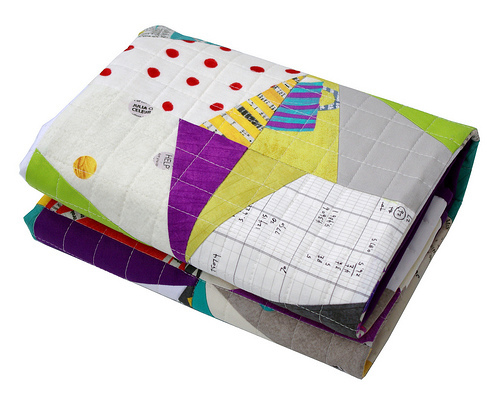 I love this quirky fabric and have stashed yardage for more quilt backs. (From these last two images you can also see that I like to match the bobbin thread with my backing fabric when quilting). This quilt is already crossing the Pacific Ocean - on the way to a new owner, and if you ever stop by at Superbuzzy in Ventura CA (lucky you!) then you may get to see this one for yourself. Enjoy! Beautiful! 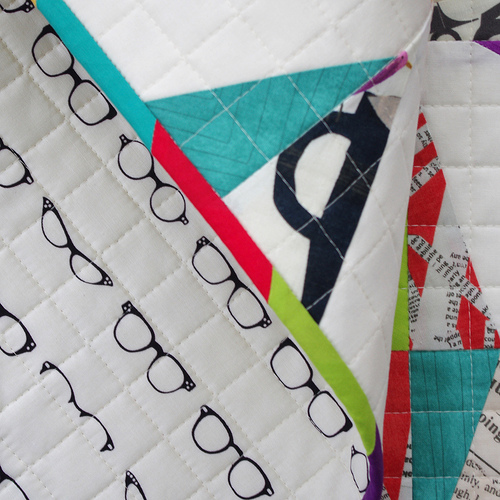 Your quilts always look so neat and tidy! Lovely--as always! Do you ever make anything that isn't fantastic? :) Thanks for sharing! 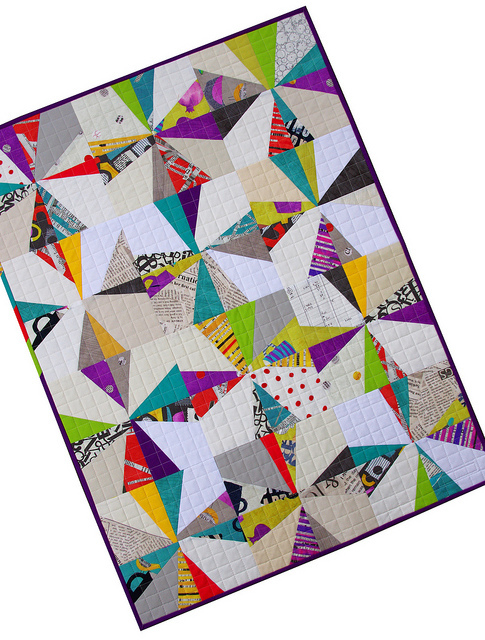 Beautiful,your quilts are always so neat and have perfectly straight lines how on earth do you do that.